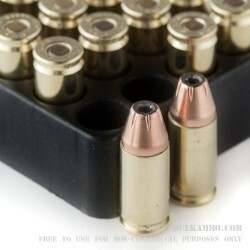 It goes by many names, but 9mm Luger is the most common handgun ammo on the market in the United States. Small, cheap, light, fast, accurate — it checks all the boxes for an ideal handgun round. 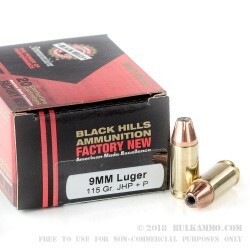 Black Hill’s +P 115-gr JHP rounds have even more oomph than your standard nine mil. 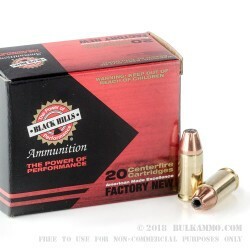 The higher powder load gives these bullets an extra kick out of the barrel, and their jacketed hollow point allows for uniform expansion on impact, promoting cavitation and reducing over-penetration. All that in a newly manufactured and low-cost package provided by the experts at Black Hills. Black Hill’s 9mm Luger +P 115-grain JHP travels at 1,250 feet per second, with a muzzle energy of 400 foot-pounds. 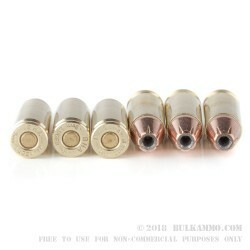 The boxer-primed brass can be reused safely.